Short ribs. Usually you see recipes for this cut of beef for slow cooking or maybe grilling. Short ribs are a popular cut of beef. They’re butchered in several ways. They are boneless or bone in. In Korea you find butterflied short ribs and ribs cut into thin slices. The French cook the thick short ribs slowly. Contrast that with Korean short ribs that are pan seared or grilled quickly. Short ribs come in slabs, like pork ribs, and are usually about 10 inches squared and three to five inches thick. Now, what’s the best way to cook short ribs. Well, that depends upon what you’re in the mood for. For this recipe, I knew I wanted a really rich deep beef flavor, so I’m using boneless short ribs a try. They’re nicely marbled and have a good amount of fat. Yes, the essence of yumminess. 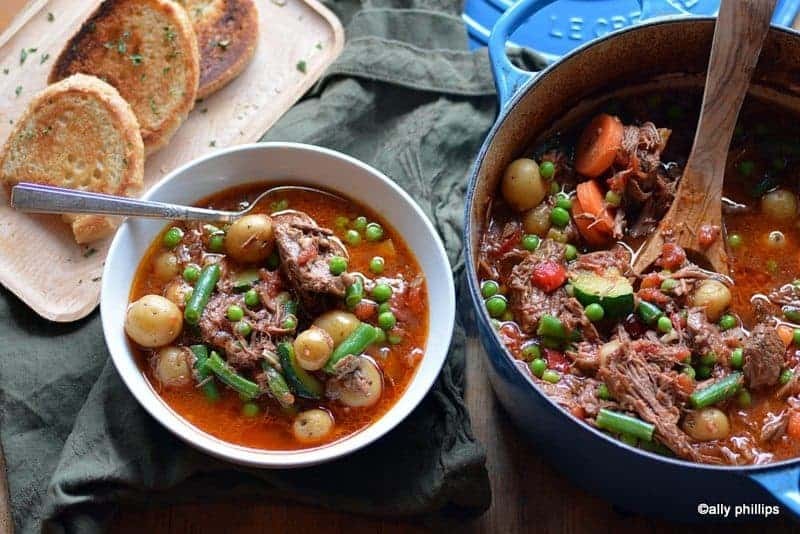 What a great choice because this short rib vegetable soup, big chunky hearty vegetables, is full of robust flavor and taste. 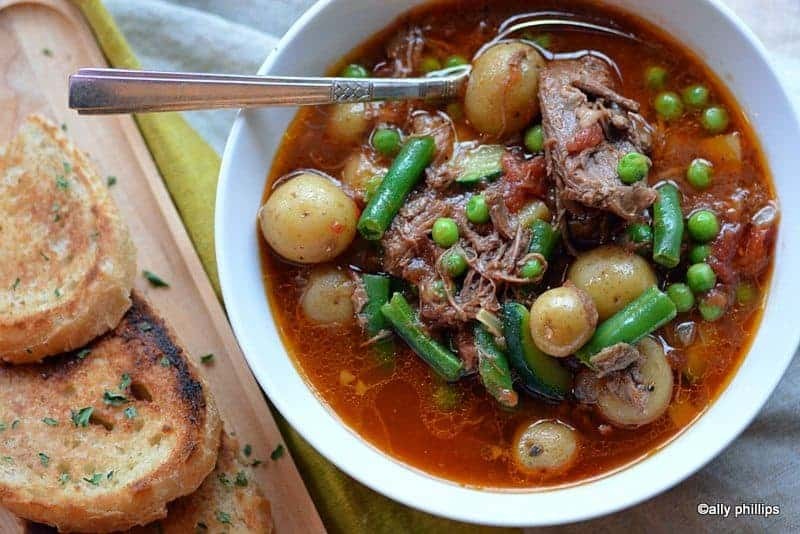 Let’s make this stew a day ahead of time and get even more depth of taste. Like bolognese, chili and other stews, soups and sauces, it only gets better then next day. Want another recipe that’s pureT comfort food? Then try these meatballs! Off the charts! Put the oil in a large heavy Dutch oven on medium high heat. Add the short ribs, sprinkle with salt and pepper and brown on all sides (about 10 minutes). Add the chopped tomatoes, broth garlic and onions. Put a doubled piece of foil on the pot then the lid. Put in a preheated 400 oven for about 2 ½ hours. Check every 45 to 60 minutes to see if you need to add any water. The liquid should be about 2-3 inches above the meat. Begin adding vegetables after about 2 ¼ hours. Put in those that require more time cooking first, like potatoes, carrots, turnips, etc. and cook another 30-45 minutes. Add those veggies (blend in to the hot broth) that can basically ‘steam’ shortly before serving (i.e., celery, peas). 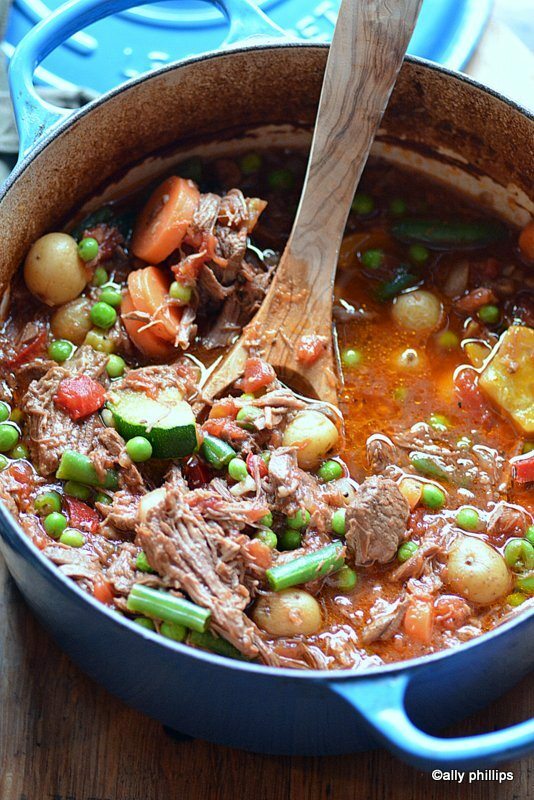 Remove and let the stew sit on the stovetop (blaze on simmer) about 30-45 minutes before serving. The veggies I chose to put in was frozen green beans, frozen peas, baby potatoes (skin on), fresh sliced carrots, celery, zucchini and pearl onions. When serving try a grating of fresh Parmesan reggiano and/or a dollop of sour cream. This stew is a complete meal. All you need is crusty bread, rolls, biscuits or hot crispy cornbread. Gotta give this a try. We love short ribs. 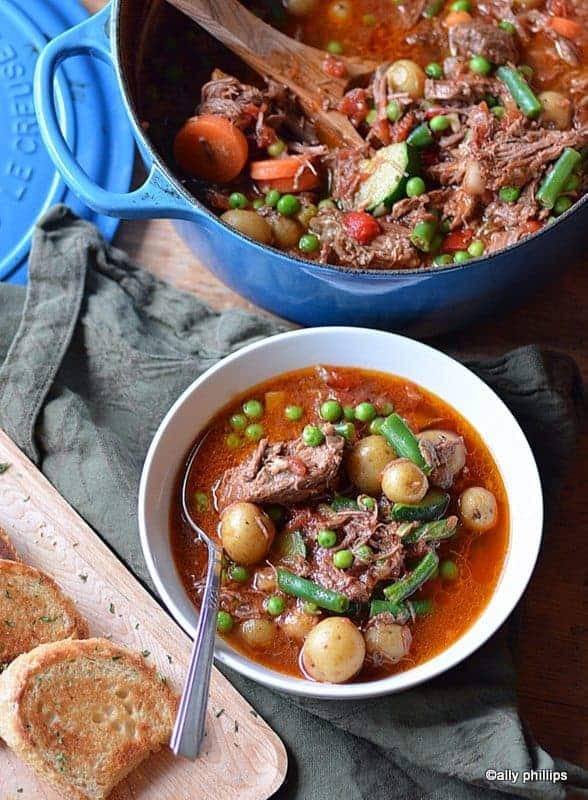 Can you do this in a slow cooker? Finally one like my mom’s!